One frequent argument against scratch cooking, is that “there is no space.” Implying the belief that cooking from scratch entails fifty pound sacks of beans, lentils, flour, and sugar among other massive-storage items. So, in an apartment is it feasible to cook from scratch without overdoing it on the storage? I would say yes, for the most part. You can cook healthy and tasty meals with just a few ingredients. And, while a few items may not be scratch cooking, you can make the majority of your meal from scratch. Of course, rice, frozen or fresh veggies, and chicken make a very quick scratch meal, but so do lentils and beans with fresh veggies and fruit. For beans at least, start them soaking in twice as much water before heading out for the day. When you get home in the evening, discard the soak water and thoroughly rinse the beans. Bring to a boil and they are ready to be added to whatever you wanted beans in. Cook double the amount of beans you need for a single meal at one time. Use the second serving worth of beans for a cold dish, such as a salad with veggies and canned fish, or fry up with veggies and sauce. For variety, prepare two types of beans at the same time and use them blended. For quick meals, lentils only take half an hour to cook and can add thickness in soups or sauces. Along with valuable fiber and some protein. From what I’ve observed, a 1kg bag of dried beans or lentils contains 16 servings. I like cooking a cup of dried beans at a time, which reconstitutes into four half cup servings. Combine servings from two different kinds of beans, or beans and lentils or rice, for more variety and satiety. Alternatively, use beans and veggies to stretch protein like fish or eggs. Eggs can be boiled in advance, and will stay good for several days in the fridge. Boil a week’s worth of breakfast eggs in one fell swoop, and save time in the morning. Eggs and fruit, alongside coffee or tea, make a very satisfactory breakfast. If you like more, a quick piece of bread or a homemade tortilla with peanut butter and honey also go well with fruit and eggs. Oatmeal is a easy staple, and can be prepared while your morning tea or coffee is brewing. Just add just-boiled water to your oatmeal, enough to just cover, and let sit for two or three minutes. Add your preferred topping, I like a tsp. of peanut butter and a tsp. of Nutella, apple and cinnamon with honey is also yummy. Alternatively, re-heat leftovers from last night’s dinner for breakfast, or take those for lunch if necessary. Much of the hassle of storage is knowing how much you will eat before 1. it goes bad, or 2. you have to move or leave. As I’m on a very short term assignment, I only have a month left to use up what I purchased. Currently I have enough beans, and lentils, and flour to easily make it without buying anything other than fresh veggies and eggs. 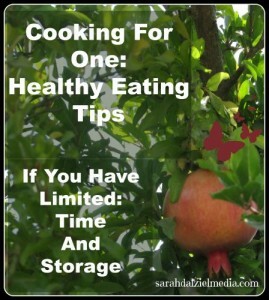 Veggies: Tomatoes, Onions, Potatoes, Garlic, Apples, Oranges, Avocados, and most other fruit do not need refrigeration. For fruits like plums and peaches, keep on the counter until ripe and then refrigerate otherwise they will not ripen. Some things stay crisper when refrigerated, like carrots and cucumbers, but it is not completely necessary. If something is wilting in the fridge, and you know you’ll only use it in soups, stirfrys, or stews (like tough celery). Then wash it, chop it up, and stick it in a container in the freezer. Just take what you need for flavoring and put the rest back until you need it again. Keep an eye on fruits and veggies on the counter, particularly citrus, and make sure to use them up before they go moldy. I normally try and buy a week’s worth of a particular fruit or veggie at a time and then make sure to use it up within the week. Onions and Garlic do not need to be used up within a week, as they will stay good for over a month. So don’t be afraid to stock up on those when you get the chance. Dry Goods: Keep dry goods away from water, and use a cloths-pin to hold the top closed to avoid spills. Provided you turn over your dry goods ever two months you should manage to avoid vermin infestations. Sugar and Sweets: Keep sugar in a sealed plastic bag, particularly if the area is known for its ants. Once the ants figure out where the sugar is, you cannot keep them out of it. Ants are also attracted to honey, so put your honey into a shallow dish of water (a moat) to keep ants from climbing all over it and getting under the lid. You can also wash the outside of the jar with hot water to remove sugar residues. I hope you found this list of tips, observations, and suggestions useful and informative. I am still learning the art of healthy solo living, and if you have any comments, additional tips, or suggestions, I would love to hear them. So, leave a comment!